Panasonic's second new 1080p projector this year, the PT-AR100U, caters to fans of home entertainment by combining a bright 2800 lumen output with a sharp 1080p image that is both high in contrast and almost perfectly color balanced right out of the box. The AR100U is designed for any multi-use room, as it functions as a home theater projector almost as well as it does as a home entertainment projector. With the lights on, its Light Harmonizer adjusts color to compensate for room lighting conditions. With the lights off, the AR100U does not show quite as well as home theater projectors in its price range, but still holds its own. While the AR100U lacks 3D capability and frame interpolation, it does include a 2.0:1 manual zoom lens and horizontal and vertical lens shift. The AR100U has an official street price of $1,499. In a pitch-black room, the AR100U's default Vivid Cinema mode shines like a flashlight at nearly 2,000 lumens. Unless you're using a 150" diagonal low-gain screen, this is way too much light (though it is an ideal mode for living room use). Cinema 1 and Rec709 modes are brighter than average but reasonable options for a traditional dark-room home theater installation. In high lamp mode both presets weigh in around 980 lumens. After switching to low lamp mode and accounting for light drop-off from the 2.0:1 zoom lens, our theater setup was just about perfect: 600 lumens on our 120" diagonal 1.0 gain screen gave us 14 foot-lamberts. Where you'll run into trouble is if you have a smaller 100" diagonal screen, especially if (like most screens) it has positive gain--say, 1.3 or more instead of the 1.0 gain Stewart Studio-tek 100 we're using for this evaluation. Even if you set the AR100U up for minimum light output (Cinema mode, low lamp, using the longest possible throw distance for your screen size), you're still going to get 480 lumens, which equates to 21 fL on a 1.3 gain 100" diagonal screen. This is a little brighter than the 16 fL ideal. In all likelihood, though, your room is not perfectly pitch-black, so the extra light will help compensate for any ambient light that is present. In a dark room, the AR100U's image is a little rough around the edges, especially when it comes to black level. But contrast is solid, and the auto iris keeps black level from becoming a nuisance. Default color calibration in the Cinema 1 mode is close to ideal before you make any adjustments at all. The image is sharp and detailed, and the AR100U's focus ring has some resistance to it, which actually makes it easier to fine-tune focus without overshooting. The AR100U's performance in a dark room is more impressive because that is not its primary purpose. The AR100U is mainly designed for living room use, where ambient light and a more reflective environment is a fact of life. 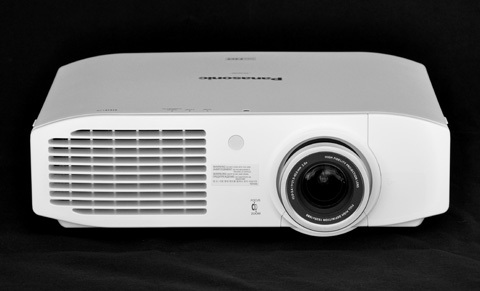 The projector's Dynamic, Sports, Normal, and Vivid Cinema modes stand as testament to this fact, each measuring around 2,000 lumens or greater. Dynamic, the brightest mode, clocks in at almost 2500 lumens. In a room with a small window or a couple of 100W lamps, the AR100U is more than capable of holding its own. Screen sizes will be constrained somewhat, but an 80" diagonal image is still pretty large, especially when compared to most people's televisions.